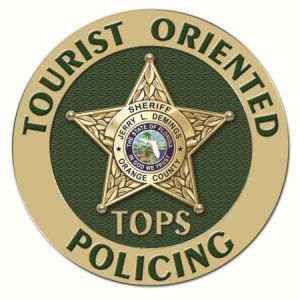 ORLANDO, FL--One of the world’s top tourist and meeting destinations, the I-Drive Resort Area, continues to utilize the enhanced support of its highly successful prototype safety program, Tourist Oriented Policing Squad (TOPS). The program allows for coverage of I-Drive located within the unincorporated area of Orange County for the International Drive Improvement District master taxing unit. The unincorporated area includes more than 4,500 acres of accommodations, attractions, entertainment, dining and shopping. This public-private partnership was launched in April 2010 between Orange County Government, the Orange County Sheriff’s Office and the International Drive Business Improvement District. Providing an increased law enforcement presence, it enables the tourist corridor to maintain its strong reputation in the travel industry as a safe and fun destination. The TOPS program is 100 percent funded through the I-Drive District via a special assessment. The I-Drive area has its own team of detectives and a crime prevention deputy assigned with specific training, knowledge and certifications in the tourist policing field. The TOPS deputies also offer various crime prevention programs and seminars to the I-Drive business community in their commitment to enhance the safety of the I-Drive area through increased visibility, communication and partnerships. Tourism officials recognize that there is nothing more important to meeting attendees than the reputation of the area. Roughly 1.4 million meeting attendees contribute approximately $2.1 billion to the area’s economic impact annually. In 2015, Cvent named Orlando the top destination in the U.S. for meetings and events. Click here for a list of Visitor Safety Tips. Visitors to the area should check here for recommended safety tips provided by the Orange County Sherriff’s Office. For additional safety information from Visit Orlando, please visit here.